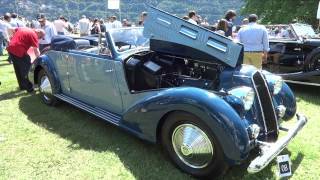 In the fall of 1933, was born the third series Astura. Several of the "news": a part of the chassis, which is now offered in two versions, the long wheelbase (type 233 L) and short (233 C), the motor (whose opening angle of the "V" is changed from 19° to 17° 30') undergoes changes in displacement (from 2606 to 2973 cm³) and power (72 to 82 HP). Other important changes relating to the braking system, which is equipped with a brake booster Dewandre, the 30% increase in the capacity of the fuel tank (60 to 78 liters). From the aesthetic point of view we find a new screen of the radiator. Also new are the front fenders. Characteristic the new slider movable rear that can accommodate - between the rear end of the body and the spare wheel - a trunk: in the absence of the trunk, the spare wheel assumes an inclined position, while in the presence of the trunk becomes the wheel vertical.